Your home is the most important asset you have. When you’re ready to build or remodel, get yourself the best General Contractor in the business! We have over 100 years of combined experience. We specialize in residential construction and are also experienced in commercial. All our experienced staff are highly experienced and certified. We only use the best materials available, and we hold ongoing training and safety seminars to ensure the procedures we use are up-to-date in style and technique. We are fully insured licensed and bonded, and some of the best warranties in the business for craftsmanship. Most importantly, we work hard to finish each project on time and under budget. Make your next project a Snap! "IT'S THAT EASY" Is a slogan we stand by! With Snap construction we are here to take the worry out of your next project. The people at Snap Construction are highly skilled, educated, and all around enthusiastic about what we do. We love to build. We love to create. We love customer satisfaction. We demonstrate these values every day by providing detailed estimates to setting up expectations on the job before the work is started and holding true to them through the finish. Put our passion in your next project! With Snap, it really is that easy! While most of the competition offers a 5 year warranty on workmanship, Snap offers up to a 10 year warranty in addition to your manufactures warranty. Some of our Quality Long Lasting Products that we Carry. Big Warranties and Quality Installation. The Storm Hit! Were you Affected? What do you need to know? Snap Contractor David Hoke, indicates that David Hoke is accredited by Haag as a Haag Certified Roof Inspector for residential roof properties. Click here Get a Quote on your next Project in a Snap! Schedule a Free No Obligation Inspection Today! 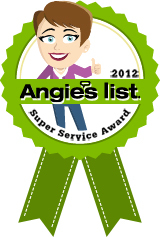 Snap is proud to announce that we have received the Angieslist Super Service Award. Less than 5% of contractors are eligible.